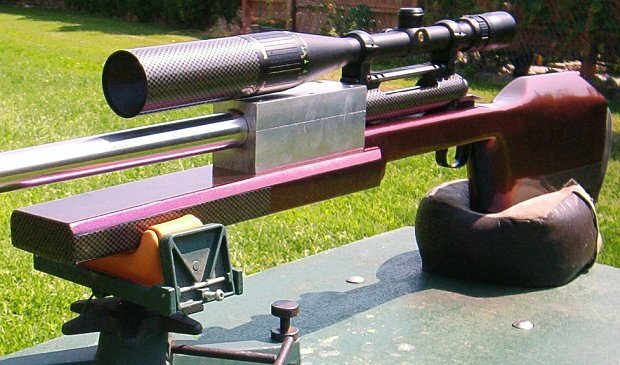 Canadian shooter Jerry Teo has created an innovative rifle system that delivers very impressive accuracy (one-ragged-hole groups at 200 yards), with economical components. Using interchangeable block-equipped barreled actions, he can switch calibers in under a minute, with just a wrench. Jerry’s radical rig has proven itself in its first F-Class competition at 345 yards (300m), delivering a 749-61X, out of a total possible score of 750-75X. We’re proud to showcase the efforts of a creative home-builder, whose entire gun, including optics, costs about what you’d pay for a premium custom action with rings, trigger guard and scope rail. The stock’s prismatic Duplicolor “Mystify” paint changes color depending on the light–shifting from purple to violet/blue to deep red. Initially, I wanted a Savage action, but I later selected the Savage-made Stevens 200 when it became available for even less money. I bought complete Stevens rifles then sold off most of the parts. Net cost of a bare Stevens action is about $200 Canadian ($165 US) after selling off the barrel, stock and other parts I wouldn’t need. That’s pretty economical. With the floating bolt head used on Stevens/Savage actions, I believed I could get match-quality lock-up without the need for costly “blue-printing” work common to solid bolt designs like the Rem 700. No trueing work has been done to either of my Stevens actions. They are used in “out of the box” condition. For this project, I wanted an optimal cartridge for both short (300m) and long (1000m) range F-Class competition, using the popular 139/142gr 6.5mm bullets. To keep costs down, I wanted one rifle, with one load, to do it all. The chambering had to use readily-available and inexpensive brass, fit a standard bolt face, allow me to reach at least 2850 fps without excessive pressures in a 30″ barrel, and operate with high load density (for good ES/SD). The cartridge needed to offer all this while giving longer barrel life than the 6.5-284 and less barrel heat per shot fired (i.e. using less powder). With F-Class relays needing upwards of 22 rounds, having barrels overheat during the summer was a big concern. I also wanted my rifle system to switch between barreled actions simply and quickly so that I could use one stock in multiple applications or competition classes during a match day. I wanted to be able to switch actions/barrels without the need to rezero/sight in the rifle. Yes, these were pretty tall goals but after building and testing two complete, blocked ‘uppers’ (block-fitted barreled actions), I can say that my results have met and exceeded my goals and expectations. For this rifle, I created a custom wildcat, dubbed the 6.5 Mystic. I wanted something that approached the performance of the 6.5-284, yet burned less powder, with better barrel life. 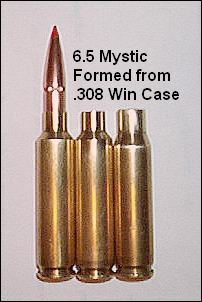 The 6.5 Mystic is my 40°-shoulder version of the 6.5-08 or 260 AI. I start with .308 Win brass, Winchester headstamp. (Winchester brass is readily available in Canada, and is much less expensive than Lapua or Norma up here.) After necking down, I do a light neck-turning, taking off no more than .003″. When finished, this gives a tight fit in the chamber. My chamber is throated for a Cartridge OAL of 2.90″ with the 139gr Lapua Scenar. With the 6.5 Mystic, shooting 140gr-class bullets, I can approach the velocity of a 6.5-284, using less powder and cheaper components. Using Hodgdon H4831SC (46.5 to 47.5 grains), I can push these bullets to 2900 fps with excellent brass life. (I can touch 3000fps but accuracy and case life is poor). Compared to a 6.5-284 then, my 6.5 Mystic offers higher load density (100% with H4831SC and 139gr Scenar), similar 2900+ fps velocity (of course the 6.5-284 can be pushed faster), and I can use cheap and readily available .308 Win brass. Based on what I’ve seen so far, throat erosion is not too bad and barrel life looks promising. I looked hard at the 6mm DTAC 115-grainers before building this rifle but we can’t get those bullets readily in Canada. Plus I would need to run them very fast to match the performance of my 6.5 Mystic in the wind. Lapua claims a .610 BC for its 139gr Scenar. David Tubb estimates his 115s have a BC of about .585-595. The brass is then fire-formed WITHOUT BULLETS using Cream of Wheat over a light charge of pistol powder and any Large Rifle primer. This gently moves the shoulder forward and rarely causes neck splits. After the initial Cream of Wheat/pistol powder load, the shoulder will be about 95% formed. 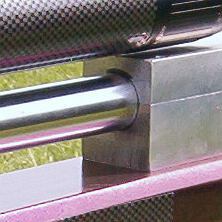 Forming cases this way–without bullets–reduces barrel wear and saves on the cost of components (powder and bullets). Once the brass has been fire-formed, I then size in the Lee Collet die, trim, neck-turn, chamfer the necks, and remove any burrs in the flash holes. Cases are now ready for full-pressure firings. After the first full-pressure firing, the shoulder is perfectly sharp and the case dimensions become very stable. About Annealing–During the forming stages of the brass, I do not anneal the necks. It’s simply not needed. With the ‘tight neck’ chamber fit, the necks don’t expand much. In fact, after firing, the bullets are a slip fit. Because I am only ‘squeezing’ the necks a bit, there is very little work hardening of the brass. I have, experimentally, started annealing my brass after about a dozen firings, but the results are inconclusive so far. I may have to modify my technique somewhat. My match load for the 6.5 Mystic employs Win .308 brass, H4831SC powder, CCI BR2 primers (Fed 210M will also work), and 139gr “naked” Lapua Scenars. I use 46.5-47.5gr to push the Lapuas between 2900 and 2950 fps. 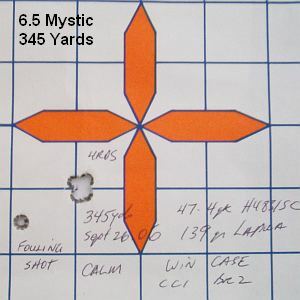 Pressure-wise, I’m near “practical max” even at 46.5 grains, so I advise anyone trying the 6.5 Mystic (or similar 6.5-08 wildcat) to start low and work up. The 47.5 grain load is almost compressed in my Winchester-headstamp cases, so be careful. In other rifles, I usually shoot moly but with the 6.5 Mystic, the load density is pretty much 100% so I don’t have room in the case to add more powder for a moly bullet. You may be suprised that I’m not using Lapua cases. Well, the Winchester-brand brass seems to work as well as anything and it is very durable. Some cases have seen 15+ reloads and still have tight primer pockets. I do, however, bump the shoulder on my cases when there is resistance to chambering. The 6.5 Mystic has proven to be very accurate, particularly with my first Gaillard barrel. I do all my load testing at 200 yards and beyond. When conditions are dead calm, the 139gr Scenars will print a ragged hole at 200 yards. Right now, both barreled actions will do 1/4-MOA or better at 200 yards. Version 1 (aluminum block) is the most accurate, and will shoot a ragged hole at 200 yards pretty consistently. Version 2 (steel block) typically groups about 1/2″ center to center at 200. At 300m (345 yards), both rifles will shoot 1″ or better groups, with Version 1 being the better of the two–sometimes holding a 1/2″ cluster. But both “uppers” are more than accurate enough to meet my original goals and to shoot a “possible” in F-Class. In the real world, at a 300m match in October, I shot a 749-61X, out of a total possible score of 750-75X. I think that’s pretty good considering I have limited experience in F-Class and I have a lot to learn about reading the wind. In good conditions, I believe the rifle will deliver an honest 1/4-MOA at 200 yards with Scenars. I’ve tested three other bullets: 142gr Sierra MatchKing, 140gr Hornady A-Max, and 140gr Hornady SST. They all shot well. But in my rifle, the 139 Scenar was the clear winner. At 200 yards the Sierras and Hornadys would shoot somewhat larger groups–not tight clusters like the Scenars. The Scenars are so consistent I don’t bother sorting them. I shoot them right out of the box. I did note that the Scenars’ shank diameter is a bit fatter than that of the Sierra or Hornady bullets–by a few ten-thousandths. Perhaps this is one reason the Scenars out-perform the other brands in my barrels. My 6.5 Mystic currently has two complete barreled actions, each with its own barrel block. The idea was to make a “switch rifle” (with two barrels) by just changing complete barreled actions, block attached. Just unfasten two bolts (that connect block to stock) and swap one barreled action for the other. The blocks remain fastened to the barrels. Of course you could also swap barreled actions by unbolting the upper and lower sections of the block. Unbolting the unitized block/barrel assembly from the stock is faster and simpler, however. You don’t have to remove the scope and you don’t have struggle to get the barrel aligned just right. The original block (shown in most of the photos) was made from two slabs of aluminum bolted together, sides milled, with a hole bored for the barrel. For simplicity, the bottom slab is thicker than the top. This way you can put the barrel hole off-center without a lot of machining. The bottom is high enough so that the action clears the stock when installed. This free-floats the entire action. I recently added a second barrel block made from mild steel with stainless bolts. The new block is very similar in size and bolts into the original stock just like the aluminum block. The new steel block is much heavier than the first aluminum block. Also, the barrel shank diameter for the new steel block has been reduced to 1.240″ (orig was 1.25″). The only reason for the change is that the new block-maker has a slightly smaller-diameter boring tool. The barrel blocks are mated to the stock using two 1/4″ diameter machine bolts (pillar-bedded of course). All of the recoil forces are actually handled by the stock. If you look at the photos, you will see that the block butts up against the stock. Bedding compound ensures they touch. Bracing the block against the stock makes for an extremely rigid set-up as the top of the stock would have to shear off or crush for the block to move. The barrel blocks are removable, so you can swap in a different barreled action, block and all. And I’m not limited to Stevens/Savage actions. Since the action floats above a cut-out in the stock, you can use most actions, so long as the barrel diameter (contour) fits the block. Since the block supports the barrel above the fore-end, there is cooling airflow around the whole barrel. This barrel heats up evenly over its entire length and circumference. Moreover, the block acts as an enormous heat sink, helping cool the barrel in rapid fire. Barrels: Gaillard, 6.5mm, 30″, 1.250″ straight for 6.5″ tapering to .90″, recessed crown (Version 1); Gaillard, 6.5mm, 30″, 1.240″ straight for 6.5″ tapering to .90″, flush crown (Version 2). Both 1:8.5″ twist. 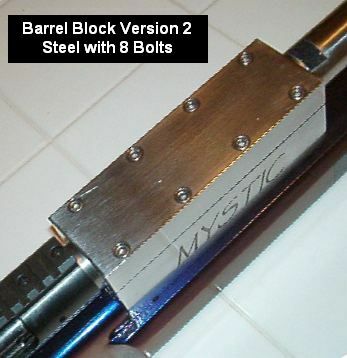 Barrel Blocks: Aluminum, 6-bolt, 1.250″ bore (Version 1); Stainless Steel, 8-bolt, 1.240″ bore (Version 2). Optics: Bushnell Elite 6-24X, 1″ diam. in Burris Signature Zee Rings, Farrell +20 MOA sight base. Barrel block designs are not uncommon, particularly in long-range Heavy Guns. However, in most cases the block is designed to remain fixed in the stock. The block may even be permanently mounted in the stock with epoxy and/or bolts. In Jerry’s rifle, by contrast, the block is easily removed by loosening two bolts. Then the block-fitted barreled action can be lifted out and replaced with another block holding a second barreled action. This allows a rapid barrel/caliber change with just an allen wrench–no need for a barrel vise. 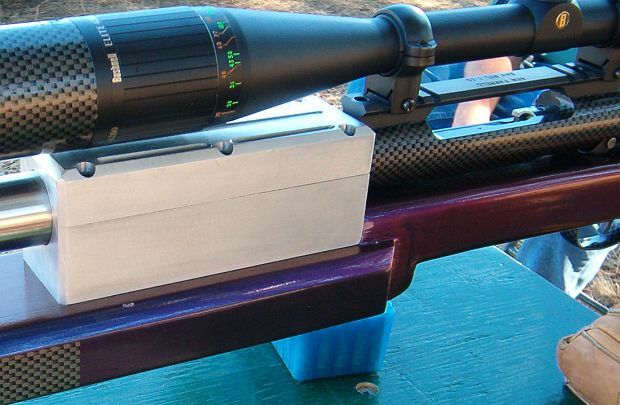 (Yes, you could simply keep the block in place, remove the top half, and drop in another barreled action, but this would require removing the scope. Moreover, getting the barrel aligned just right in the block is tricky and time consuming.) 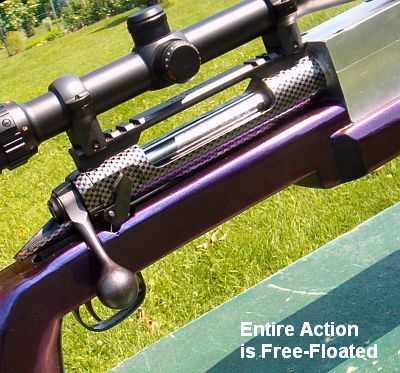 In practice, an F-Class competitor could shoot Open Class with a 6.5mm or 7mm chambering, then switch out the block-fitted barrel action with a .223 or .308 unit, and proceed to shoot F-TR class with the same stock. You can do the change in less time than it would take to adjust a three-way buttstock. According to Jerry: “Canadian F-Class rules do not restrict the width of the buttstock. I wanted maximum stability so I went with a 2″-wide flat on the toe (underside) of the stock. Using a Protektor front-type bag (for a narrow fore-end rifle), in the rear, this fits the 2″ flat very well, and the gun tracks like it’s on rails. Editor’s Note: You’ll see wide flats like this in long-range benchrest Heavy Guns, but thus far, American F-Class shooters haven’t gone that route. 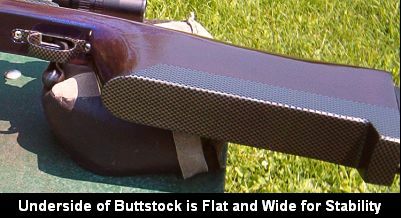 At the U.S. F-Class Nationals, we saw no stock with a rear buttstock flat wider than about 3/4”. It is unclear whether this dimension will be regulated in the future either in the U.S.A. or internationally. I don’t use exotic reloading tools or techniques. In fact, most of my reloading gear is made by Lee. All seating is done with a standard .260 Rem Lee seating die on a Lee Challenger press. For neck sizing and decapping, I use a .260 Rem Lee Collet die. This produces sized cases with very low runout (measured runout is under .001″ using a Sinclair concentricity gauge). You also don’t get the build-up of brass at the base of the neck, as can happen with bushing neck dies. The neck-shoulder junction stays nice and crisp. COLLET DIE TIP: If you want to adjust the neck tension using a Lee Collet die, you can simply chuck the mandrel in a drill and reduce the diameter with some sand-paper (to increase neck tension) or you can order a mandrel the next caliber larger and turn it to whatever diameter you want (the larger the mandrel diameter, the less the neck tension). The standard mandrel that comes with the .260 Rem die works fine for my turned Winchester brass–neck tension is about .003″. Still it’s nice to know I can adjust neck tension if necessary. I did have to devise a trick to get the Collet die to work optimally with my Ackleyized shoulder. The Collet die works by having the Collet sleeve moved by the shellholder on the upstroke of the press. However, with my Ackleyized brass, the “improved” shoulder limits the travel of the Collet sleeve before it goes far enough to size the neck down. I needed something that would get the Collet “fingers” to squeeze “earlier”. So, I use a steel washer as a spacer between the shellholder and the bottom of the Collet die. This provides “hard contact” for the base of the Collet die but at a higher point (relative to the shell-holder). 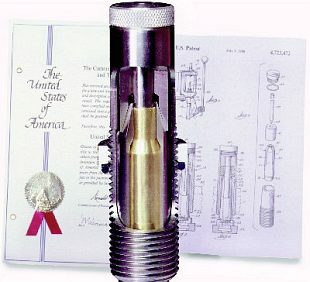 Another option would be to send Lee a few cases and bullets and get a custom Collet die for $50 US. Whenever the brass gets stiff to chamber (usually after 3 to 4 firings), I bump the shoulder back using a Redding 7mm-08 AI full-length sizing die without the decapping rod. I move the shoulder just enough (about .0015-.002″) for easy chambering. Being sized for a larger caliber, the 7mm-08 FL die doesn’t touch my 6.5mm necks–it acts just like a body die. Other than that, I have no special methods for reloading. I don’t use a powder measure to throw charges. Instead, I use a simple 3.1cc Lee Powder scoop, then trickle up for the last half-grain or so. I weigh all my charges using a Lee balance-beam mechanical scale. I’ve found the Lee scale is sensitive to three kernels of H4831SC–about a tenth of a grain. The primer pockets are cleaned using a Dewey tool. Primers are seated using a Lee Auto Hand primer. Neck-turning and case-trimming are done with a Forster tool. But the adhesive panels aren’t just for looks. The vinyl helps to protect the paint where it would wear thin from rubbing on the bags. The stick-on vinyl also reduces friction substantially, helping the gun to track smoothly in the bags. The adhesives provide a smooth and very durable surface to aid in recoil tracking/consistency on the stock. If So, You Can Help Support 6mmBR.com by Making a Small, Secure Contribution. Copyright © 2010, AccurateShooter.com | 6mmBR.com, All Rights Reserved. No reproduction of any content without advanced permission in writing.